Eurysyllis Ehlers, 1864 is a syllid genus currently comprising seven species, of which members are characterized by a relatively small, dorso-ventrally flattened body, with the dorsum covered by longitudinal rows of tubercles, and appendages (i.e., antennae, peristomial and dorsal cirri throughout) composed of a single article each. 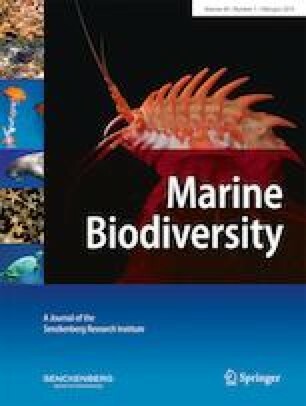 The analysis of the material collected off the southeastern Brazilian coast resulted in the identification of three new species of Eurysyllis, which also represent the first record of the genus off Brazil. The new species differ from each other and from their congeners in details of the shape of tubercles, number of eyes, and morphology of falcigers. These three new species are herein described and compared to their most similar congeners; a key for the identification of all species of Eurysyllis is provided. We would like to thank Dr. Ana Paula Falcão (CENPES/Petrobras), Prof. Dr. Helena Lavrado (Universidade Federal do Rio de Janeiro), and the staff of the “HABITATS” and “AMBES” projects for collecting the specimens analyzed in this study. We also thank Enio Mattos and Phillip Lenktaitis (Instituto de Biociências/Universidade de São Paulo) for preparing the specimens and photographing them under the scanning electron microscope; Aline Benetti (MZUSP) for providing museum catalog numbers; and Karen Osborn and Geoff Keel (USNM) for providing the support to MVF during a visit to that institution. FRPC currently receives an M.Sc. fellowship from Coordenação de Aperfeiçoamento de Pessoal de Nível Superior (CAPES); JMMN currently receives a productivity grant from Conselho Nacional de Desenvolvimento Científico e Tecnológico (CNPq).